In Gold Warriors, by Sterling and Peggy Seagrave, the authors reveal one of the most shocking secrets of the 20th century. It is the story of the vast treasure Japan managed to loot across Asia, today worth billions or even trillions of dollars, the concealment of it in hundreds of sites, and the secret recovery of much of it by what would become America’s Central intelligence Agency. America helped Japan cover up this vast fortune, fooling the world into believing Japan was bankrupt after the war and was unable to pay reparations for their mass murder and material damage. Most of Japan’s vast stolen fortune would remain in the hands of imperialist war criminals, and would for decades be used to prop up Japan’s corrupt one party democracy ruled by the Liberal Democratic Party, with the CIA and the Yakuza pulling the strings behind the scenes. It would be controlled by men like Allen Dulles and John J. McCloy through their Black Eagle Trust, which managed both Japanese and Nazi War loot. The Gold would be deposited in the Federal Reserve, the Bank of England, Union Banque Suisse (UBS) in Switzerland, Citibank, HSBC and other major banks who often stole it for themselves. The gold was also used to manipulate the global economy, finance assassinations and covert ops, bribe politicians, and finance right wing political movements like the John Birch Society domestically. 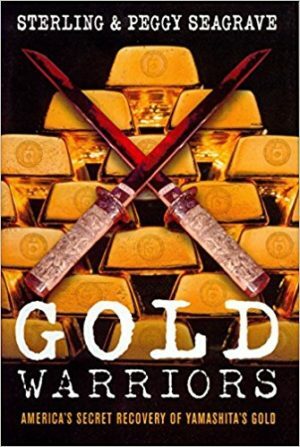 Gold Warriors tells a compelling tale of secrecy, greed, treachery, murder and lies. The book offers a window into the vast and mysterious world of offshore banking and the Gold Cartel. The authors estimate that today, the ultra-rich are hoarding over 23 trillion dollars, mostly in offshore bank accounts. Meanwhile around the world, health and education are being cut, poverty and homelessness are on the rise, and the rest of us are constantly told to tighten our belts. The Seagraves destroy the myth that America reformed Japan after the war, revealing the shocking story of the MacArthur occupation and its alliance with fascists along with Japan’s ruthless imperial family and their huge corporate backers like Mitsui, Mitsubishi, Kawasaki and Sumitomo. They used this loot to finance Japan’s postwar recovery and meteoric rise. Companies that have since become household names made their fortunes through looting Asia and employing slave labor, including that of American POWS. When the survivors tried to sue for reparations, State Department officials like Tom Foley with corrupt ties to these Japanese corporations compared these victims to terrorists. The Seagraves begin their book with the brutal assassination of the Korean Queen Min on October 7 1895 by the imperialist Japanese. In Japan, like in America, big business, organized crime, and intelligence were strongly interrelated. The Japanese Empire, like all empires, were cynical liars and claimed that Queen Min had been murdered by Koreans. With the strong-willed Queen Min out of the way, her weak husband King Kojong quickly became a Japanese puppet and soon Korea was a Japanese colony, while China suffered a humiliating defeat at Japan’s hands when it tried to intervene. Japan seized Taiwan and parts of Manchuria from China. Korea became Japanese property, and they began to loot the accumulated wealth of centuries, including gold silver and prized celadon porcelains. Japan employed an army of antiquarians to seize and catalog hundreds of ancient Korean manuscripts, sending them to Japan or burning them to destroy Korea’s cultural heritage. The Japanese even resorted to grave robbery on a massive scale, targeting Korean Imperial tombs. Japan targeted Taiwan, colonizing the island and setting up massive heroin laboratories. Taiwan would for decades become a center of the global drug trade. Japan launched a sneak attack on the Russian Empire in 1904 and Russia was forced to sign a humiliating peace deal giving Japan control of its possessions in Manchuria like the South Manchurian Railway it had built. To turn a quick profit, Japan set up a massive opium growing operation. They bribed warlords and began buying up Chinese industries and land. Manchuria became what the authors call the center of “carpetbaggers, spies, secret policemen, financial conspirators, fanatical gangsters, drug dealers and eccentric army officers.” The Mitsui and Mitsubishi Corporations ran everything, making a fortune from their cut of the illegal drug trade. Through a series of provocations involving the patriotic societies and Japanese intelligence, Japan was whipped into a war frenzy and more Chinese land was stolen. Japan unleashed an army of experts to steal as much art and priceless manuscripts as they could. Around the same time Japan had been conquering Korea, America had conquered the Philippines while claiming they wanted to liberate it from Spain. With its usual cynical hypocrisy, once Spain surrendered, America crushed the Filipino independence movement with the brutal tactics it would later employ in Greece, Korea, Vietnam, Afghanistan, Iraq and a long list of other countries. Of course, it had been America itself which had forced Japan to end its long isolation setting into motion the chain of events that had led to Japan’s rapid modernization and imperialist adventures in the first place. When the Second World War began to go very badly by 1943, Japan was no longer able to ship its loot back to Japan, and so began to hide it all over the Philippines and Indonesia. Prisoners of war and the local Filipinos were forced to dig massive tunnels. These slave laborers were often massacred or buried alive to keep the tunnels secret. The Japanese often buried their loot near historical landmarks and hospitals because they were less likely to be bombed. They smuggled gold into the Philippines on phony hospital ships, since they would be less likely to be sunk by American submarines. They hid some of the gold by loading ships full of treasure and sinking them for later recovery, and huge underground chambers were filled with thousands of tons of gold. The Americans managed to discover gold was being hidden during the war, thanks to one of their spies. There were at least 176 treasure sites in the Philippines. By the time the war ended, the Americans had found so much gold that if it became publicly known it would have destroyed the Bretton woods system which relied on gold being valued at 35 dollars an ounce. The Bretton Woods system was itself backed with the huge sums in Nazi gold the US had managed to seize and hide, the authors of Gold Warriors suggest. Back in Washington, there was already a group dedicated to stealing and hiding Nazi gold: the Black Eagle Trust. With their massive off-the-books money, they would bribe politicians and finance coups, covert operations and psychological warfare. Soon, the Golden Lily loot was being managed by the same people. It was being moved across the world, being used to prop up banks around the world. UBS in Switzerland, HSBC in Hong Kong, the Bank of England, Chase Manhattan. Hidden in 42 countries between 1945-47, the gold was used to make huge loans to Britain, Egypt, and the Kuomintang in China. Politicians around the world were bribed with gold certificates. The intersection between Wall Street and intelligence involved vast sums completely unknown to the public. The notion that the CIA could ever be held in check once it had control of this vast fortune was a joke, and it perhaps led to events like the Kennedy assassination. A nearly 60-year cover-up after that event would not be surprising when one remembers that the entire mainstream American media was controlled by former Office of Strategic Services men, as discussed in Science of Coercion by Christopher Simpson. The CIA and Office of Policy Coordination controlled much of the media worldwide as part of Frank Wisner’s infamous Operation Mockingbird, putting out nonstop Cold War propaganda. In Japan, criminal Yoshio Kodama made a deal to turn over $100 million to the CIA for his immunity (worth 1 billion dollars today). During the war, Kodama had managed to save 13 billion in gold, platinum, diamonds and other loot. America had not bombed Japanese industries, instead targeting workers’ homes. This was likely because American corporations were heavily invested in Japan, just as they were in Nazi Germany, where American-owned factories supplying the German war machine were spared during the war. In occupied West Germany, Denazification was a scam, and so too was the removal of imperialism in Japan. Trials targeting Japanese war criminals were fixed to prevent the Emperor’s role being known. The US set up a special fund to bribe witnesses. Kodama was put on the CIA payroll, and behind the scenes he created the misnamed Liberal Democratic Party headed by corrupt politicians. The Yatsuya fund was used to control the Japanese underworld. The Keenan fund named after Joseph Keenan, the chief war crimes prosecutor, was used to bribe witnesses to protect the Emperor and his cronies. The M-Fund was named after General William Frederic Marquat, who was in charge of restructuring the Japanese economy. Marquat was also entrusted to disband Japan’s infamous Unit 731 that ran bio-warfare research using prisoners as guinea pigs during the war, but instead of disbanding, they were recruited by the Pentagon and used to develop germ warfare against China and North Korea. The M-Fund was used to bribe politicians, and evolved into one of the most scandalous financial scams in history. Soon, it would corrupt American politicians as well. Nixon turned the M-Fund, which had been run by MacArthur’s cronies like General Marquat along with the CIA and the corrupt Liberal Democratic Party, over to the full control of Japan in exchange for illegal kickbacks funneled into the 1960 presidential Campaign he lost to Kennedy. Part of the deal was for Nixon to return Okinawa to Japan, which he later did once he finally got elected. Golden Lily loot was funneled back to far right movements in the US, and would help finance Joseph McCarthy’s witch hunts. Another source of such wealth was the global drug trade, as the CIA would manage it in cooperation with the Chinese Kuomintang and Japanese and Korean organized crime. Together, these sources of wealth would be used to fund the World Anti-Communist League or WACL the global network of fascist drug dealers and terrorists loved by Ronald Reagan. In the final chapter of their book, the authors provide a brilliant summary of the politics of heroin, relying heavily on Doug Valentine’s classic The Strength of the Wolf. In Japan, McCarthyism took a much bloodier course with a massive assassination program combined with a COINTELPRO-style war on anyone who dared to dissent. Even American and British officials could be targeted for assassination if they threatened to expose MacArthur’s alliance with war criminals and gangsters. For assassinations that were even more sensitive, KOTOH was employed – an acronym formed from the names of five Japanese army officers who performed assassinations. Much of Gold Warriors describes the hunt for treasure in the Philippines. The Japanese were the masters of this, quietly returning for decades to recover their loot. Future Philippines president Ferdinand Marcos learned of the gold by befriending Santa Romana and making deals with the Japanese to recover gold, becoming one of the richest men in the world through his discoveries. It was Marcos gold that paved the way for Nixon’s visit to China, with Marcos agreeing to deposit 72 billion in Gold in China’s Bank accounts. Marcos had long been used by the CIA to bribe Asian governments into supporting American policy, and in return they allowed him to get rich by selling his gold to Saudi princes or trading it for drugs from Asian or Latin American cartels. The golden Lily loot that led to his rise also led to his downfall, when he bargained too forcefully with the Reagan White House and the CIA who wanted him to use his fortune to back Reagan’s scheme to create Rainbow dollars. Marcos then became one of the first victims of a CIA color revolution. As CIA-backed NGOs flooded the streets with angry protestors, his American sponsors kidnapped him and airlifted his fortune out of the country. Gold Warriors reveals that from the underworld to the military and intelligence agencies, to the corrupt politicians to the titans of finance we are ruled at every level by gangsters. After reading it, one may even wonder how much of the CIA’s gold is involved today in financing charlatans like Alex Jones and the rest of the US “patriot” movement, since their radio stations are heavily involved in selling gold and silver. It is a fantastic book that anyone with an interest in the CIA, drugs, or fascism should read, because it offers a window into the shadowy world of offshore banking, where around a trillion dollars is transferred around the world every day. It names some of the most powerful families in the world: the Krupps, the Rothschilds, the Oppenheimers, the Warburgs and the Rockefellers. All are tied to banking and the gold cartel, where fortunes are incalculable. In fact, the gold and diamond cartels are still looting the world today with the same greed and brutality as imperial Japan. In the Democratic Republic of the Congo alone, ten million people have been killed in a brutal war to loot the country of gold, diamonds, uranium, and rare earth elements. Furthermore, most of the world’s gold is hoarded today in the Swiss Alps, in secret bunkers and underground tunnels designed to survive a nuclear war. The hunt for the gold stolen by imperial Japan even resumed as recently as 2001, when George W. Bush sent navy seals on a secret mission to recover it. Hugo Turner is an anti-imperialist blogger and member of the Mont Order society. Read other articles by Hugo, or visit Hugo's website. This article was posted on Monday, June 11th, 2018 at 6:57pm and is filed under Book Review, China, CIA, Corruption, Espionage/"Intelligence", Fascism, Federal Reserve, Germany, Japan, Korea, Media, Militarism, North Korea, Philippines, Taiwan, United States, US Terrorism, War, War Industry, World War Two.